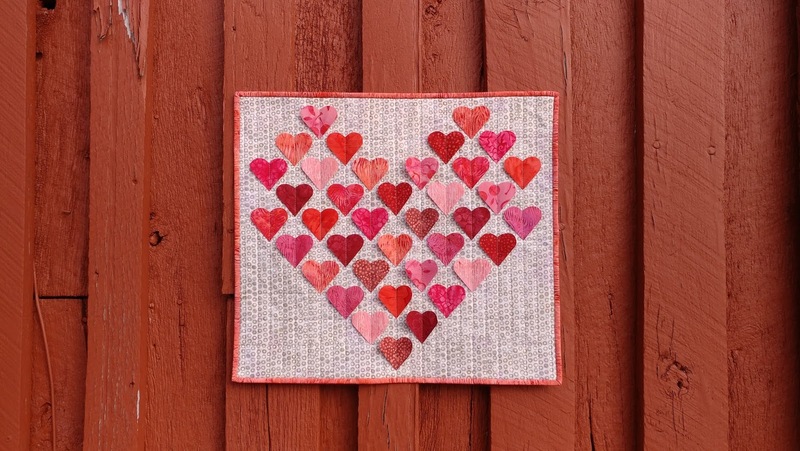 Slice of Pi Quilts: Happy Valentine's Day! 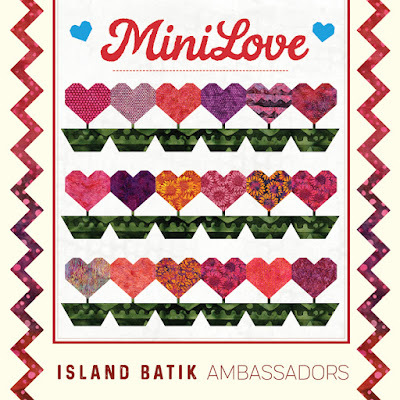 I started with some red and pink Island Batik scraps (all sent to me by Island Batik either last year or this year as part of the ambassador program). I pressed the scraps onto Pellon 808 Craft Fuse. 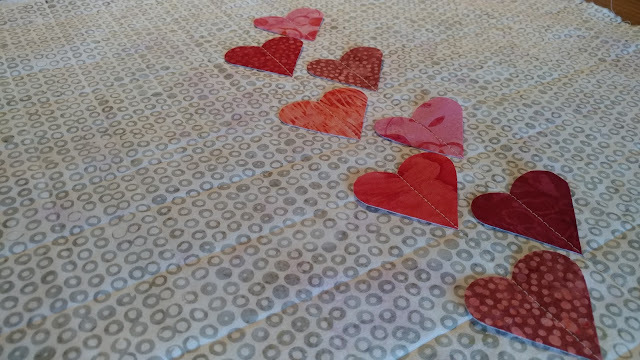 Next, I cut 2" hearts from the pieces. (All steps exactly the same as the Galentine mug rugs!) 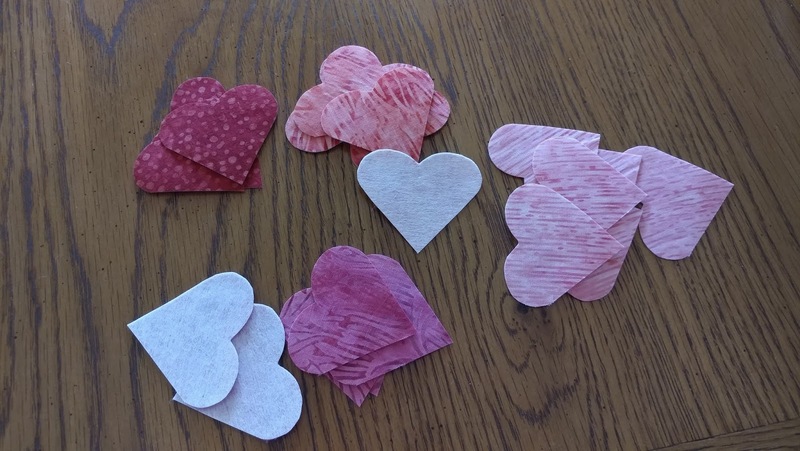 This time I made 38 hearts. 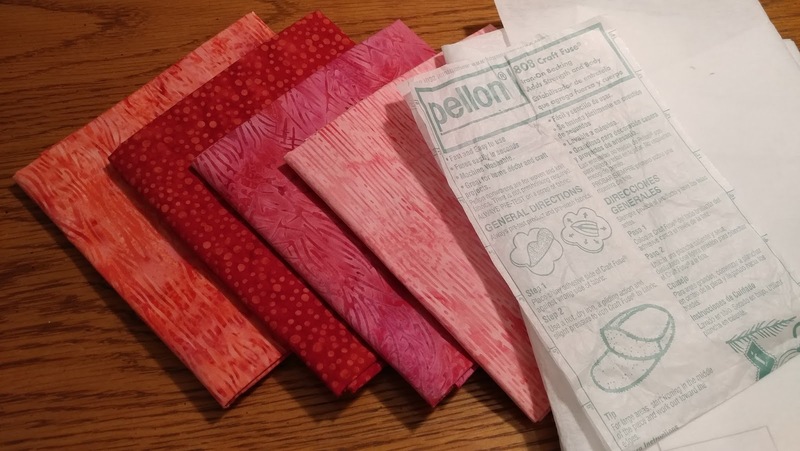 Next I cut a fat quarter of a light background fabric for the quilt top and a fat quarter of a pink/peach for the backing, then made a quilt sandwich using Warm & Natural batting. 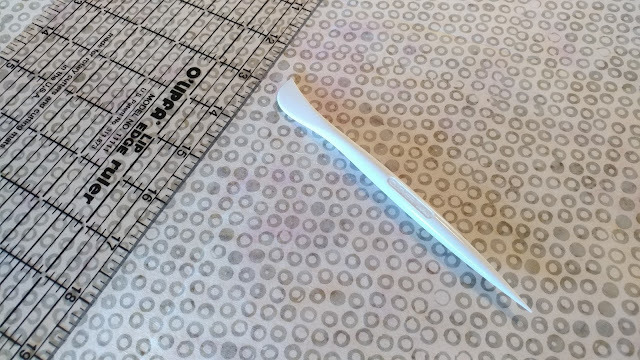 I didn't even pin baste it because it seemed to stay put well enough without it. I used my acrylic ruler and hera marker to mark a grid with both horizontal and vertical lines spaced 1 1/2" apart. 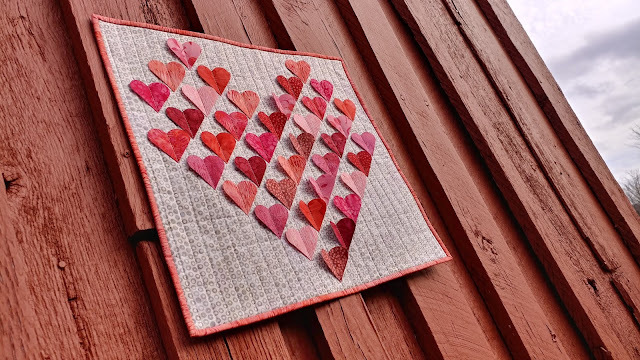 I used the intersections of the grid to line up the bottom tips of the hearts, arranging them into one large heart shape. 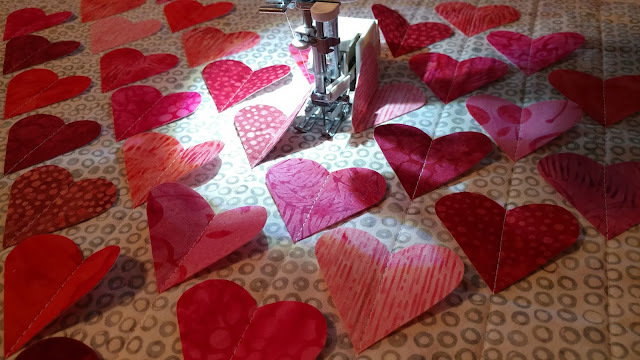 Once pleased with the placement, I used my walking foot and 50wt Aurifil thread in Light Sand #2000 to quilt vertical lines through the centers of the hearts, using the vertical grid lines as a guide. 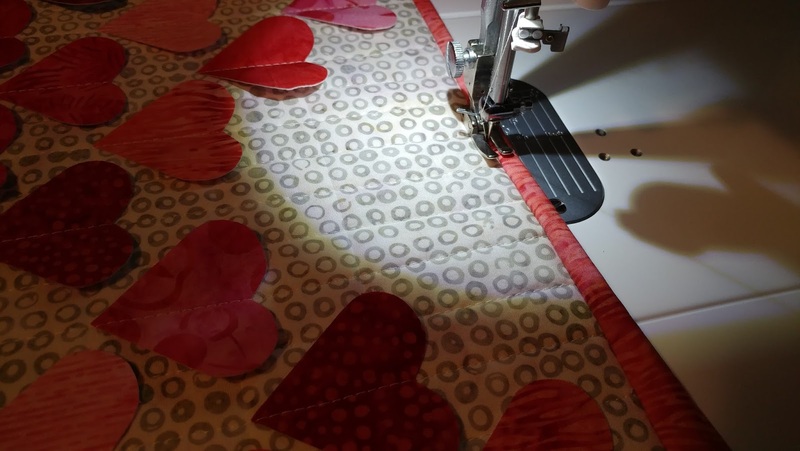 Once all the hearts were secured, I quilted an additional line between each vertical line, just because I like the look of more dense quilting lines. 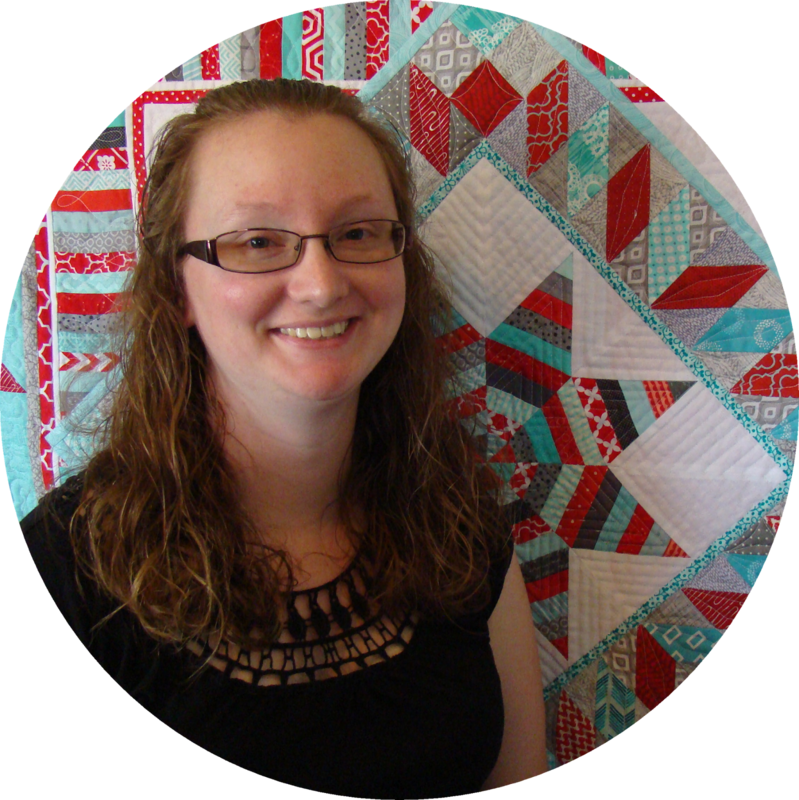 I trimmed the quilt to 17" x 19" and machine bound it using 2 1/4" double fold binding. 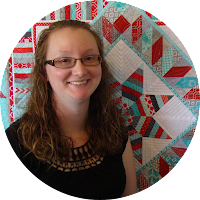 I gave away all my mug rugs, so I'm excited to have a matching mini quilt that I get to keep! Happy Valentine's Day, quilty friends! Lovely! I like how you take and idea and keep working with it, Laura. So often I feel I have one idea and immediately get pulled to another before I can refine and explore more. Love it! Like a floating heart shaped cloud of hearts! Good idea to use the same technique for both projects this month. I really love these hearts and the way hanging is spectacular. Sew cute!!! Love the barn as a backdrop for your photos. Pretty, I like that the hearts can move. 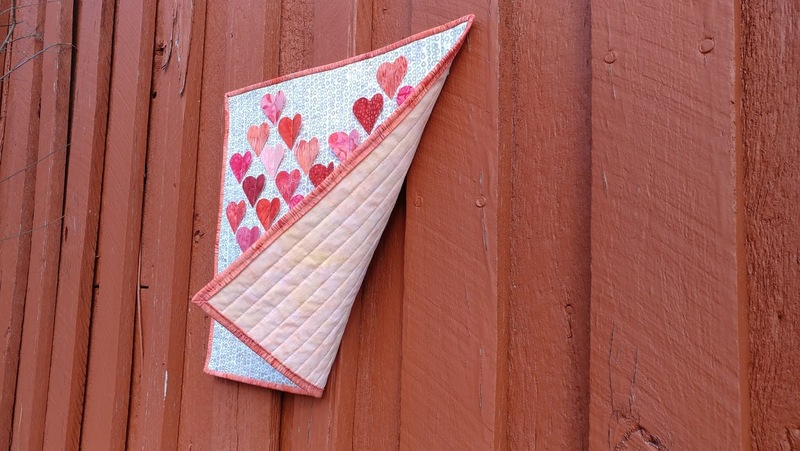 Such a cute mini quilt! Fabulous design! It's just a pretty as the mug rugs. Really like the simplicity and uniqueness of the design. Your hearts are so perfect!! This is lovely Laura! I love the idea of the 3D hearts. Love it! And more quilting is always better :) I love that you arranged the hearts to make a giant heart. 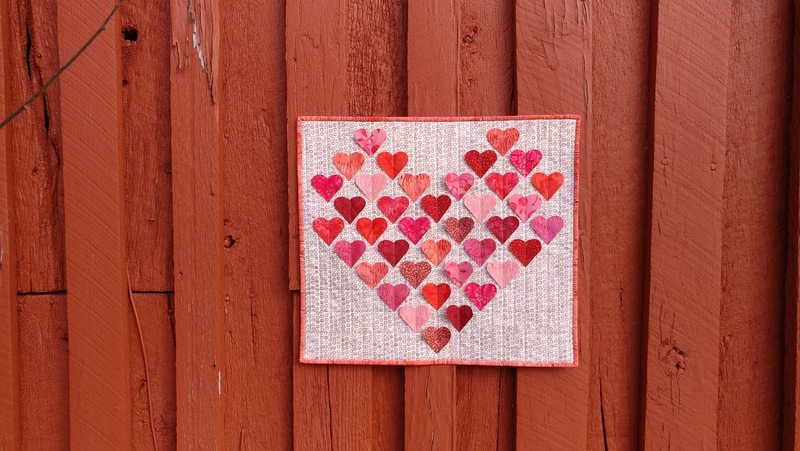 These hearts are a great way to embellish a quilt.